Swap cauliflower for the mashed potatoes in this decadent-tasting-but-healthier side that’s perfect paired with roast chicken or seared steak. Bring the milk to a boil in a large saucepan. Add the cauliflower, season with salt, partially cover, and cook over medium heat until the cauliflower is very tender, 12 to 15 minutes. Strain through a sieve set over a bowl, pressing to extract as much liquid as possible. Purée the cauliflower with 3 to 4 Tbs. of the milk in a food processor until smooth. Add 3 Tbs. sour cream, and pulse until smooth. Divide among 4 individual buttered gratin dishes (or use 1 large dish). Place on a large rimmed baking sheet and sprinkle with the Cheddar. Bake until the cheese melts, 3 to 5 minutes. 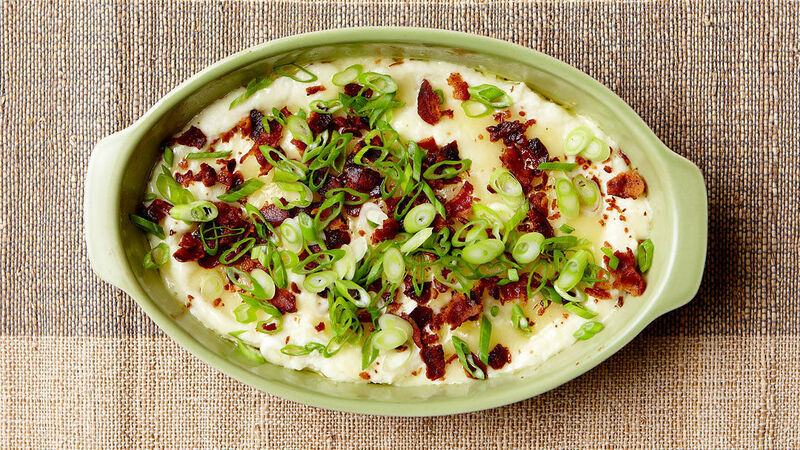 Crumble the bacon over the top, sprinkle with the scallions, and serve. Good recipe. I've been cooking my cauliflower in milk for quite a while. It doesn't dilute the flavor and seems to remove the sulfur overtones. For me, instead of sour cream, I add cream cheese to the puree. It really creams it up, smooths it out, and brings it all together nicely. Next time,I'll add some sour cream, also. That should really send it to heaven! I love cauliflower purees and cooking in milk brings this to next level. I like to get the max liquid out of the cauliflower by putting it in a potato ricer. The cauliflower is too fibrous to actually be able to press through, but it sure does get the liquid pressed out....just press, remove the cauliflower and repeat. You get a much denser and less watery puree this way. This was incredible. The day I made it I didn't finish until late in the evening so I put it in the refrigerator for the next day with the bacon on it. We reheated it and everyone loved it! I was hungry enough I forgot to put the chives on it - so next time for that. I also didn't press to get all the milk out (just put a little less milk in it in the blender) and I probably should have cooked it a bit longer and only blended a little at a time (took a LONG time to blend when you put the whole pot in at once). Spouse loved it, my 100 y.o. mother loved it and I loved it!